Aviation advertising specialists unveil new campaign for TAG Farnborough Airport. As aviation advertising specialists, Design Inc is happy to see the return to Farnborough of the iconic and original SBAC Air show. A return to the spiritual home of British flying (as it was here that Samuel Cody first got airborne in 1908) and site of so much rich heritage of experimental innovation in flight.To mark the occasion TAG Farnborough Airport (call sign FAB) – the rightful heirs to this heritage and operators of London’s dedicated business airport have commissioned Design Inc to create a new flagship advertising campaign The ‘absolutely iconic’ concept features the TAG Farnborough Airport architecture re-engineered into the ultimate flying machine. How FAB is that? 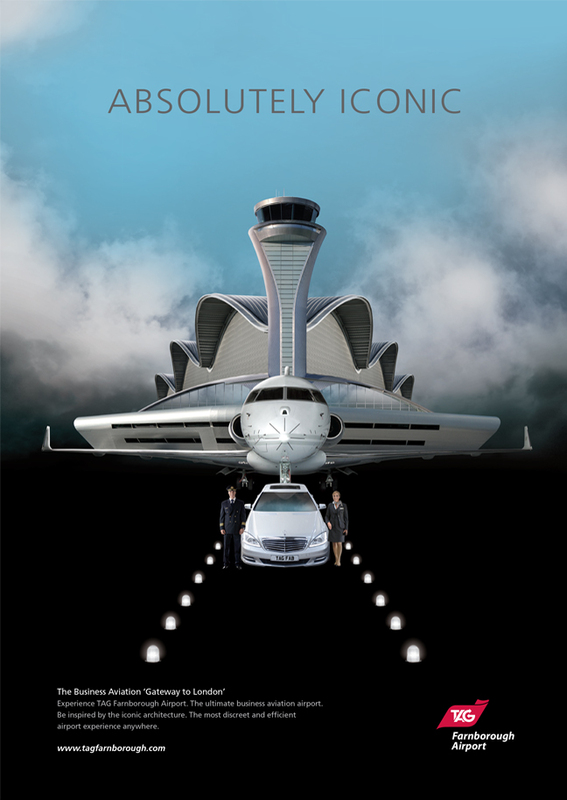 TAG Farnborough Airport is an award winning dedicated business airport providing the ultimate exclusive aviation experience: VIP passenger lounges and business services, Excellent fixed base operations and hangarage. Passengers can drive directly to their aircraft and pilots and support teams are equally well catered for. To coincide with the 2014 Air Show, TAG Aviation are holding a landmark art exhibition in the unique space of the historically important and Grade 1 Listed Wind Tunnel Buildings, looked after by the Farnborough Air Sciences Trust (FAST) this site has received development funding and along with support from Rushmoor Borough Council and corporate sponsors is being launched as a unique event venue. The first event being this exclusive Artliner-curated show. The Wind Tunnels Project will include specially commissioned works by artists of global standing including Anish Kapoor and Michelangelo Pistoletto. Design Inc are aviation advertising specialists and provide a full range of advertising and marketing services for TAG Aviation, including TAG Training and TAG Charter as well as TAG Farnborough Airport. This work has included integrated campaigns as well as below the line communications and employee engagement projects. To speak to one of our aviation advertising specialists, please contact Daniel Gilbert on 01784 410380 or by email.